A new interactive map that has plenty of useful applications for all types of communicators. 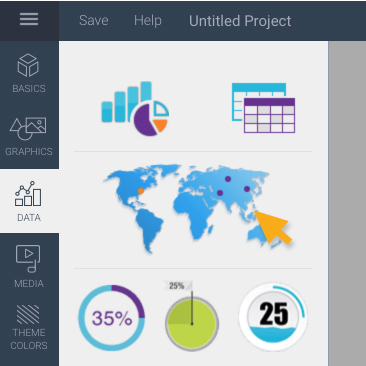 Click on Data left panel. 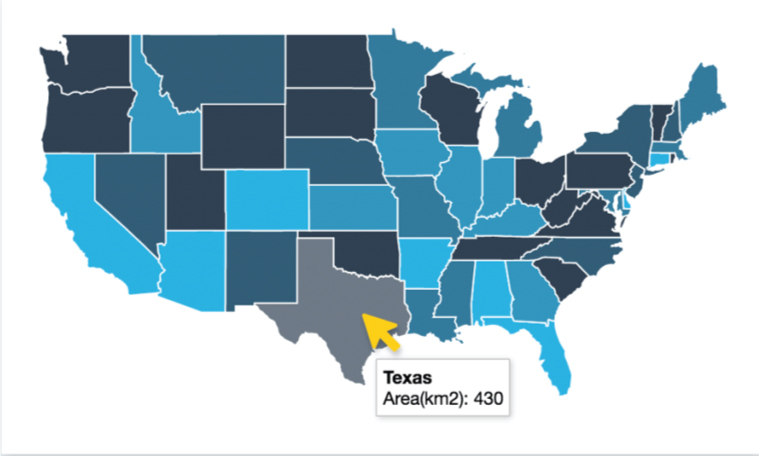 Click Maps underneath the charts and tables. You can then search for any country by either typing its name in the search bar at the top right or scrolling through the list. 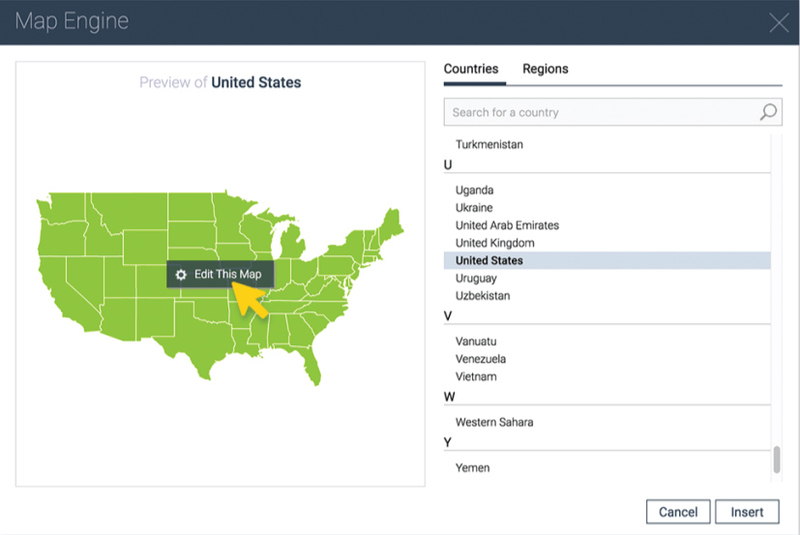 Under the Regions tab, you can also visualize major world regions, such as Africa or Asia. Once you’ve selected your country or region, you can then click on the Edit This Map option in the middle of your map preview to insert your data. 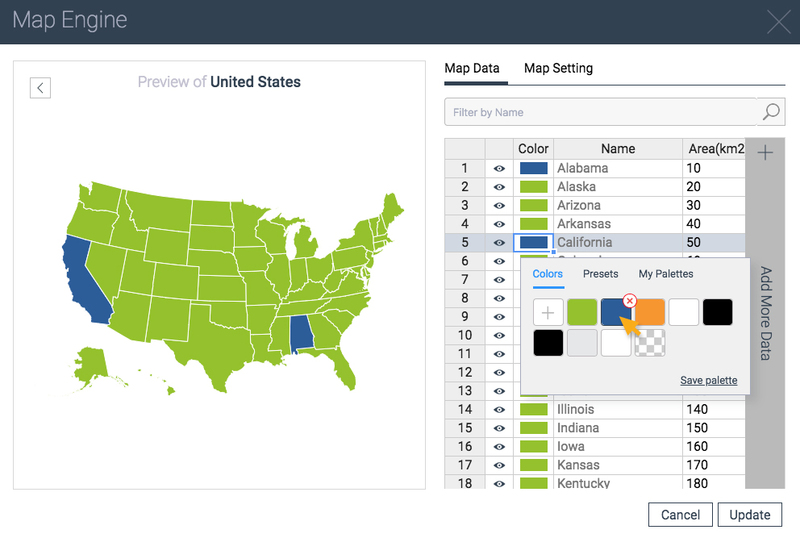 When inserting your data, you’ll see that each state or country’s area is shown by default under the Map Data tab. You can either choose to display this column or eliminate this information by simply right clicking over any cell in the column and then choosing the Remove This Column option. Next, you can insert your own information by clicking on the Add More Data option and then paste your information from Excel or Google Sheets into the column. You can add as many columns of information as needed, just make sure to rename your column with an appropriate title by clicking on the cell and typing in the name. Tip: Before you copy data from Excel or Google Sheets, make sure it is in order according to the appearance of each country or state in Visme’s Map Data spreadsheet. You can also click on the swatch under the Color column and choose previously used palettes under the My Colors tab or apply any of Visme’s 50 color combinations under the Presets tab. 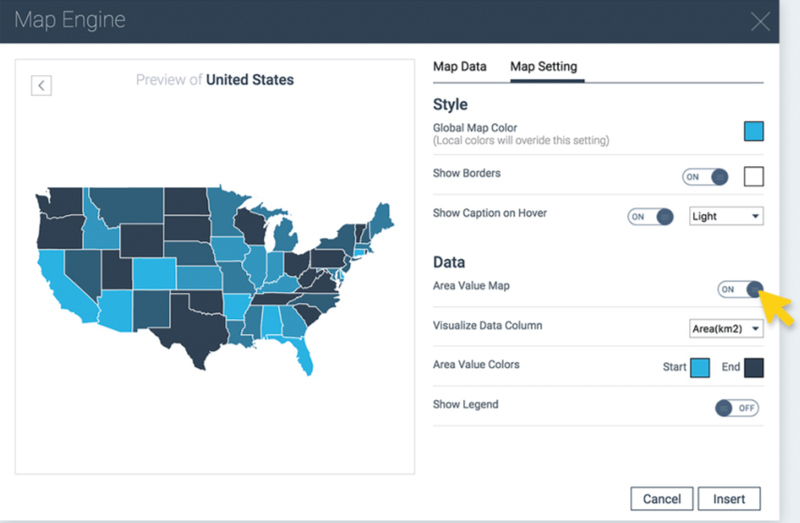 Under the Map Setting tab, you’ll find several options that will allow you to further customize the way you visualize your data. For example, you can choose a Global Map Color (although the local colors you defined in the previous step will override this setting), or you can Show borders between states or provinces and set a color to them. You can also activate the Show Caption on Hover so that when the cursor moves over any state, the data inserted in the previous step is displayed. In order to create contrast with your global map color, you can choose a light or dark colored caption. Next, you can display the data inserted under the Map Data tab by activating the Area Value Map setting. Once you do this, other options will appear, such as a drop down menu with the names of all the columns of data your created in Step 3. Here, you can choose which column of data you’d like to visualize. If you’re dealing with numerical data, you can visualize the range of values in your data set through a corresponding range of colors. To do this, simply choose a Start and End color under the Area Value Colors setting, and the Map Engine will automatically assign a hue within this color range to each of your data points. Also, you can activate the Show Legend option to display the colors that correspond with each range of values. From the drop-down menu, you can choose whether to display it to the right, left, top or bottom of the map. Depending on your background color, you can also choose to make the color of your Legend Text dark or light. Tip: If your information is textual, not numerical, apply a color to each individual state in accordance with its category, following the instructions outlined in the previous step. Finally, you’re ready to publish and share your interactive map. Simply click on the Publish button at the top of your screen. You can then share this URL with anyone so they can view your project from anywhere.